offer for car park flooring? Building parking facilities requires teamwork and each individual project comes with its own unique challenges. This calls for an innovative team that are able to think on their feet and back it up with experience. Bolidt is an in-demand team player in the industry with over 50 years of experience. 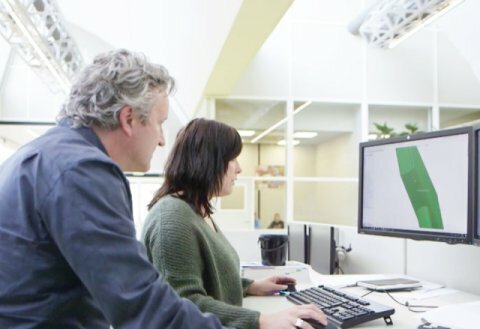 All of Bolidt’s resources and expertise are kept under one roof, which makes collaborating with partners and finding innovative solutions that much easier. 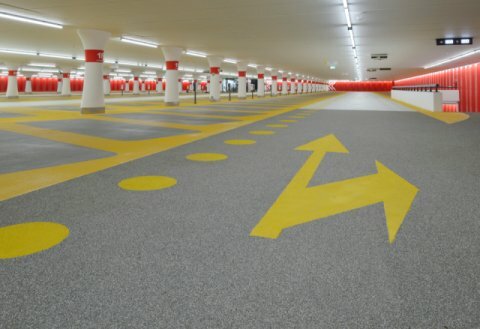 Bolidt supplies car park flooring systems for both new constructions and renovations. When renovating existing facilities in particular, solid know-how and experience with various base layers are essential. Each phase of the renovation deserves the attention of specialised teams. 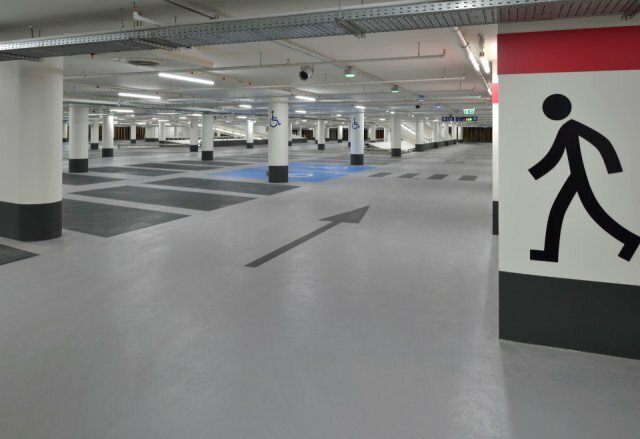 Having worked in and out of parking garages for decades, Bolidt have a different Boligrip® system for each area of the car park. This is just part of what makes Bolidt the perfect partner for parking garages. At Bolidt we like to look to the future. Our products are designed to be future-proof. This is why Bolidt flooring systems last longer than the market alternatives. 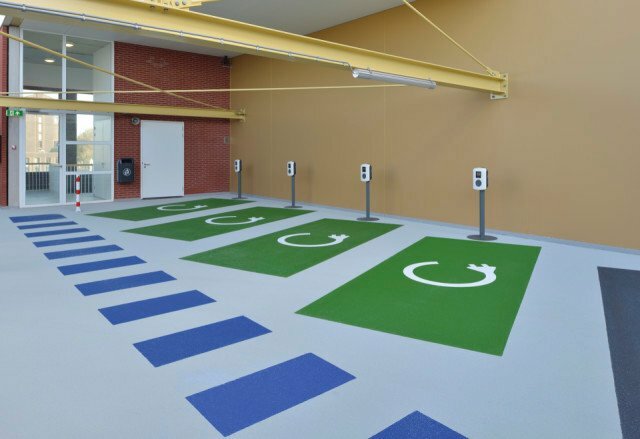 The Boligrip® series is especially designed for parking garages. It’s made up of synthetic-based resins with additives throughout the pigmented compound. Many flooring systems use grains of sand to enhance the grip of the surface. For both the Boligrip® 50 P and the Boligrip® 200 P, natural scattering materials, with a Polished Stone Value (PSV) of ± 72, are matched to the colour scheme. This high polishing value equates to a longer service life and an increased grip and skid resistance. Commonly used scattering materials, such as quartz sand or silver sand, have a much lower PSV and as such are worn down much sooner. The stone that we use is not only much harder, but also maintains a better standard visually. When floors inevitably become worn, the sand coating can leave black spots that appear like dirt. Bolidt, however, matches the colour of the scattering material with that of the floor, so wear marks are virtually non-perceptible. 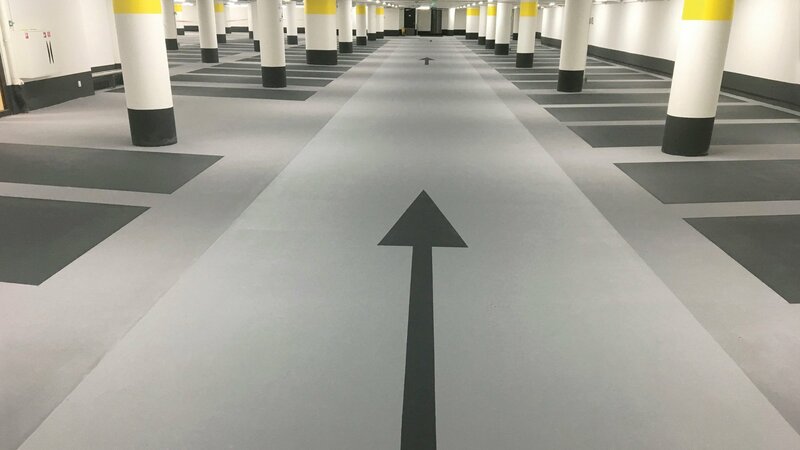 There’s a whole lot more to choosing a car park flooring system than finding a good quality floor. Through the consultation process, factors such as traffic and user intensity need to be taken into consideration. 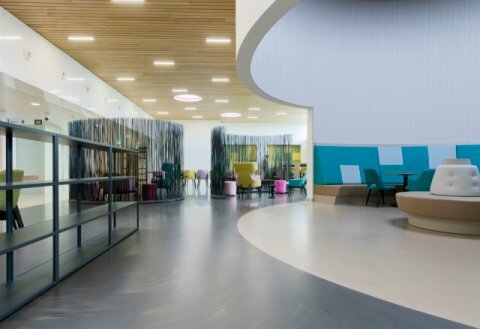 With a clear picture of the individual use-case, the flooring system can be developed accordingly with custom-made solutions if need be. 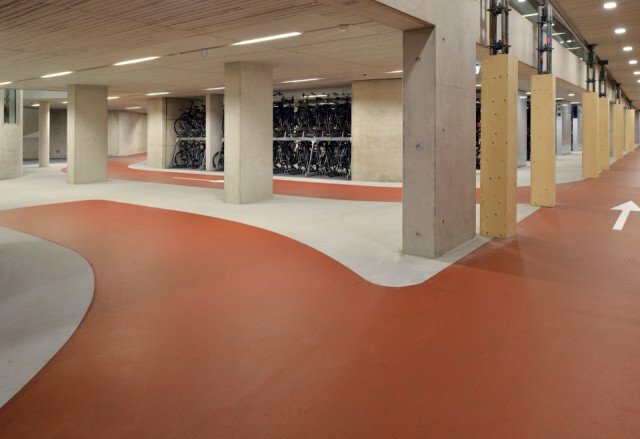 Certain properties of a car park flooring system go without saying; slip-resistance, durability, and general wear and tear. There are, however, much more subtle aspects to be considered. The industry at large has moved towards creating the optimal user experience. This is often achieved through music, illustrations, colours and aroma. 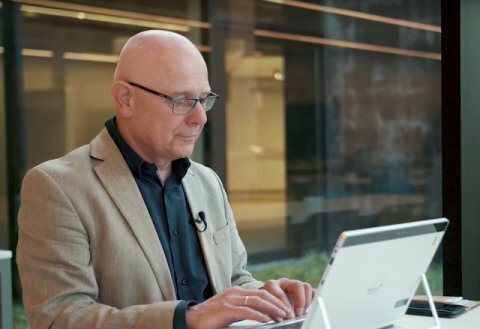 Through experimenting in our in-house lab, we like to co-create with customers and suggest ideas of how to make the garage more comfortable and safe for the user. With the flexibility of our synthetics, no design is off limits. 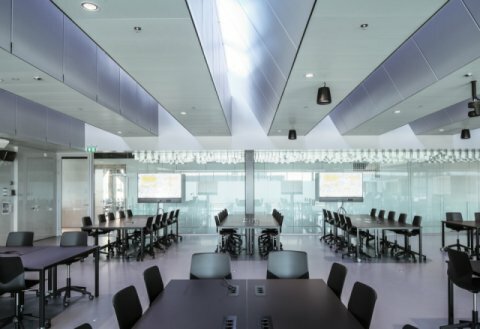 Wayfinding and directions are particularly important design features when ensuring a safe and comfortable environment for the user. At Bolidt we have a whole host of design options when it comes to this. If desired, the pedestrian areas can vary in texture from the driveways, and of course, we welcome creative ideas. 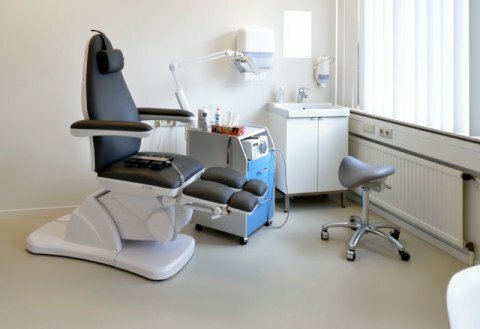 A low level of maintenance ensures minimal hindrance to the usage of the facility and its users, as well as low maintenance costs. The impermeable nature of the Boligrip® series equates to an economical, long-term investment. On top of this, each individual space of the parking facility is tailored to its specific use, furthering the lifespan of the floor. 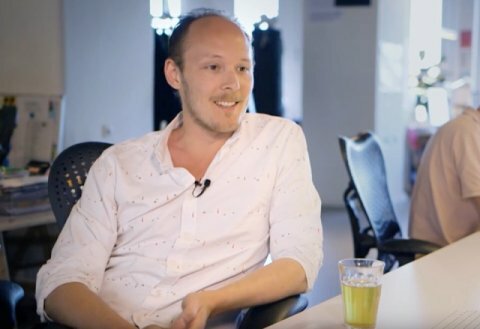 At Bolidt we like to keep close relationships with our partners. 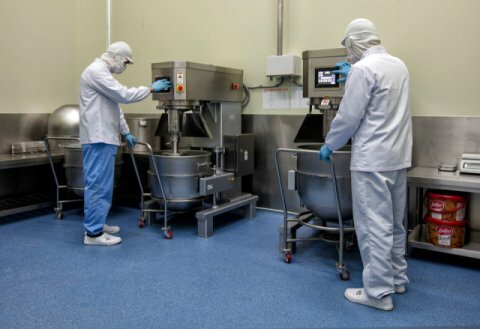 This way, any queries can be immediately addressed by our team of specialists, for the entire lifespan of the floor. 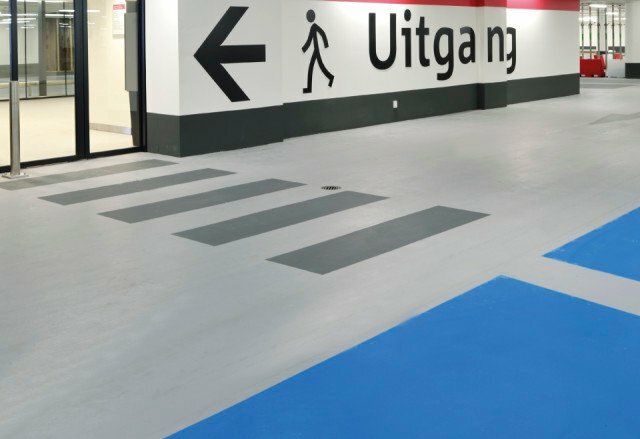 With the continual development of our synthetic flooring, and our unique expertise of the industry, Bolidt is the perfect partner for the building or renovation of a parking facility. To find out more information on our Boligrip® series as well as our work in the parking industry, please see our car park segment.